Hmm, what a funny custom order. Another version of my Here Comes the Bride wedding cake card - custom order for an October wedding. 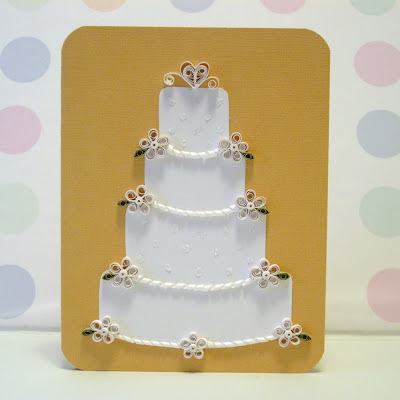 I chose a lovely mustard color for the card and kept the cake white on white with quilled flowers and spirals, a hint of sage green in the leaves and a touch of white glitter. 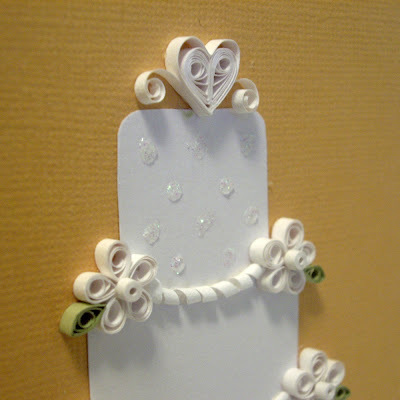 This card will definitely stand out in the crowd, one the lucky couple will remember forever. A lot of my cards are like little pieces of art, this could even be framed for a memory to last a lifetime. Please feel free to contact me if you'd like a custom wedding cake card. Lovely! It looks so delicate!